Pace engineering has CNC O.D. grinding capabilities to 14” in diameter and 42” long. Tolerances of .0003” are possible on bear journals with T.I.R. of .0002” over a 30” shaft are common. Since grinding is an intricate part of a three-machine cell, costs are tightly controlled. Other grinding capabilities include centerless grinding to 10” in diameter with both through feed and plunge grinding and I.D. 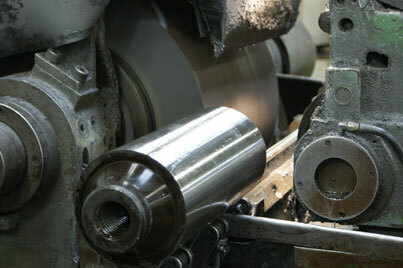 using hard turning and roller burnishing. Hard turning on O.D. is quickly replacing the slower O.D. grinding as customer’s demand lower costs without sacrificing quality.